DELRAY BEACH, Fla., Jan. 5, 2017 /PRNewswire-USNewswire/ -- The Delray Beach Police Department recently honored a group of injured veterans served by Wounded Warrior Project® (WWP). 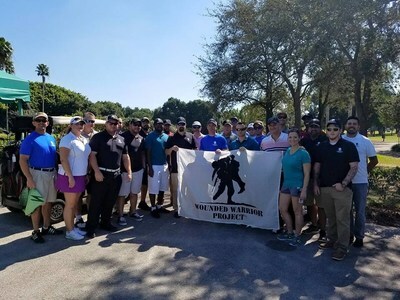 The ceremony featured a breakfast, golf tournament, and special presentation by the mayor of Delray Beach that recognized wounded service members. Warriors teamed up with law enforcement officers for the 18-hole game, and among them was Army veteran Eddie O'Neal. He said the ceremony where he and 24 other warriors were honored was humbling because of the respect he has for others who serve outside the military. "It was an honor to be held in high esteem – especially among WWII veterans," he said. "I have the utmost respect for our police officers. They don't go to foreign countries to protect our rights, but they do it every day here at home." For Eddie, golf is a chance to clear his head but also to connect with other warriors like him. He's been playing since 2009, and he said it's always had a military angle to it. "I was introduced to golf by the Salute Military Golf Association," Eddie explained. "I was honestly just glad for the chance to get out for a day with some other veterans and shoot around the greens. I knew one warrior coming into this event, and I love meeting new people." "The most rewarding part of the day was just speaking with the police officers and other veterans," Eddie said. "They have seen and sacrificed so much. There's so much we can learn from their strength and humility. I felt special and appreciated to be considered their peer." WWP programs offer settings that provide opportunities for injured veterans to form bonds. The programs assist injured veterans with mental health, physical health and wellness, career and benefits counseling, and connecting with other warriors and their communities. Generous donors make it possible for wounded warriors to benefit from program resources at no cost to them.